The D.O. Cariñena is little known to most in the world of Spanish wines. There are only 29 wineries in the Cariñena wine region, and only a handful of the wines are exported to the United States. The closest we have been to the Cariñena wine region in Spain was on a train ride from Logrono, in the Rioja region, to Barcelona. We passed through the city of Zaragosa. Although Zaragosa is not in the region of Cariñena, it is very close by and in the same autonomous area of Aragon. Until this past week, we had not tasted a single wine from this region. The wines of the region are mostly red with Garnacha and Cariñena (Carignane) being the most predominant. In 2012 the Cariñena wine region launched an awareness campaign to showcase the wines from this region. Part of that campaign was a seminar and tasting held at the Piperade restaurant in San Francisco on Thursday, May 15, 2014. We attended as part of the media and trade. We tasted six wines, with Master Sommelier Andrea Robinson leading the discussion. The seminar was followed by a walk-around tasting of additional Cariñena wines. Those we enjoyed with delicious Tapas dishes prepared by the chef at Piperade. The Cariñena wine region was named an official Denominacion de Origen in 1932. In 2011 Cariñena was declared a “Protected” area. Protected designation is an extra layer of control over what grapes are grown and how the wine is made. The region survived the Phylloxera blight that devastated most of Europe’s vineyards in the 1860’s. The reason, the mite that causes this vine disease could not survive in the stone soil of this region. This soil is unique to this wine growing area and the Cariñena wineries have adopted the mantra “Crafted in Stone.” The terroir of the region is also influenced by the Ebro River and Valley. The vineyards are located from 1300 to 2600 feet in elevation. There are very large differences between day and nighttime temperatures. Add in the Cierzo winds, and you have the total factors that give the Cariñena wines their character. http://en.wikipedia.org/wiki/Cierzo. In the Cariñena wine region, there 1600 growers and 35,000 acres of vines. Many of the small growers belong to cooperative wineries. One of the largest and most notable is Bodegas San Valero, managing 700 growers. As we continue our exploration of Spanish wine country, we will be sure to visit this region in the coming years. The area consists of many small villages and seems like a very friendly and non-touristy place to visit in Spanish wine country. The tourist office in Santiago De Compostela recommended that if we had a chance, be sure to visit the town of Cambados, “It is the center of wine activity in the Rias Baixas.” We packed our bags and left our Parador in Pontevedra heading towards Cambados for a day trip before heading south towards Madrid. It turned out to be a great recommendation. 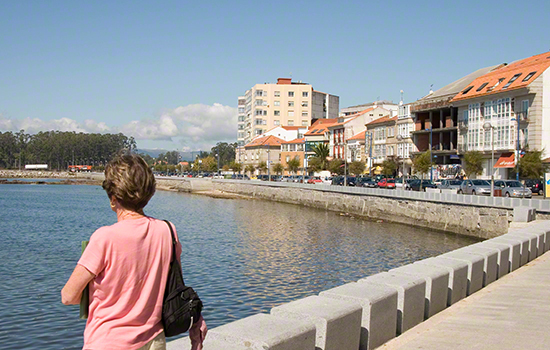 Our day in Cambados was very fun and exciting. However, if you are not a wine lover, the trip might not be that much interesting. Cambados is on the Altantic Coast and it is a beautiful ride as we followed the coastline from Pontevedra to Cambados. Everything is green in the area, the hills, the fields, and the vineyards; we are in Green Spain. As we approached the town, we took a couple of side roads and spotted workers harvesting the grapes. 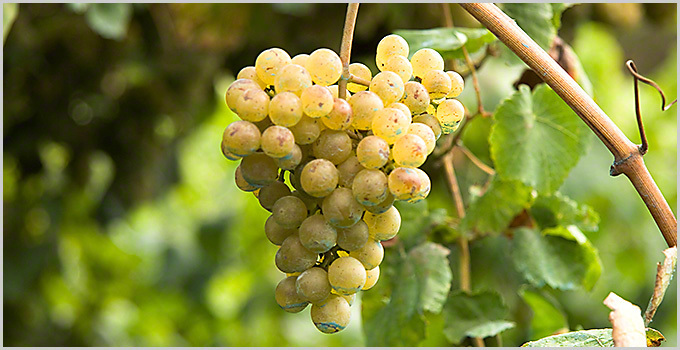 Picking grapes in the Rias Baixas is so different from that of the Napa Valley or anywhere in California wine country. First of all the pace is slow. In California the workers literally run with their cartons and toss the grapes into a one-ton bin and then rush back to fill their carton again and again. Here, the workers have one bin that they fill and then leave on the ground. The bins are picked up later, placed on palates, and brought to the winery on small trucks. The grape harvesters in Abarino do not rush, but carefully cut each grape cluster. Here in Rias Baixas and as far as we know unique to this area, the grape pickers do not have to stoop. All the clusters are above them. All the vines are trained so that they are high off the ground. This is soggy and wet wine country and this trellis system protects the grapes from rot. We drive by a winery, Bodega Martin Coax. The crush is at fever pitch at this winery. Trucks arrive with palettes of grapes that are then positioned on conveyer belts where the bins are dumped and sent to equipment for de-stemming and crushing. The town is a wine town, not like St. Helena, etc., but one with its own character. There are many vinotecas, or wine shops, seemingly out of the same mold. Displays of wine, wine carrying cases, and much more, all the same, all about Albarino wine. If you happen to visit Santiago De Compostela, consider a side trip for a day or night in this wonderful area that loves wine. Cava is what Spain calls its sparkling wine. The Cava region is just south of Barcelona. We decided on our last day in Barcelona to visit Cava and tour at least one winery. It is a very easy 45-minute train trip from Placa de Catalunya station to the train stop in the town of Sant Sadurni d’Anoia. 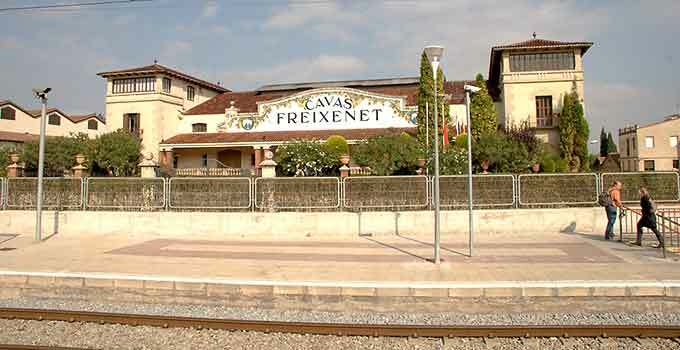 There are two big bodegas that produce Cava within walking distance of this train stop, Freixenet and Codorniu. We stopped in at Freixenet first because it is directly in front of the train station. Codorniu is about a 20-minute walk away. Here, we are told that both of these bodegas offer wine tours and tasting by appointment only. Fortunately at Freixenet it was a light visitor day, and we were able to book a 12:45 tour in English. We had time to kill so we walked into the town of Sant Sadurni. What we found was Cava land. It seems that this tiny town is all about Cava. It bills itself as the “Capital del Cava.”Each year the town celebrates the Cava harvest with various festivities. There are banners hanging from high street lights advertising the celebration that runs from September 26 to October 14. The town is so into Cava that even its metal auto barriers are in the shape of Champagne corks. As we walked the town streets, we found several small bodegas that produce Cava. The Freixenet winery is the leading exporter of Cava wine in Spain. Each year they ship millions of bottles of their sparkling wine throughout the world and much of it to the U.S. The tour is one and a half hours long and includes a ride on a trolley that takes us throughout the mammoth facility. The winery has a storage capacity of one hundred eighty million bottles. Just imagine how much space that requires. The tour concludes in their beautiful tasting room where we are able to sample the Freixenet Brut. Freixenet also has a huge merchandise and wine shop. The only things that we’re willing to carry home are a mouse pad and a serving tray. On a side note, one of the four current family owners is Gloria Ferrer, who also happens to own the Gloria Ferrer Winery in Sonoma County’s Carneros wine region. We wish we had more time to visit one of the other cava producers and explore the surrounding vineyards of this area, but tomorrow it is time to head home. We definitely would’ve visited Bodega Torres, another two train stops away. We have enjoyed our visits to Marimar Torres in the Russian River Valley, owned by a family member of owners of Bodega Torres. Our trip to Spain has been a wonderful experience. 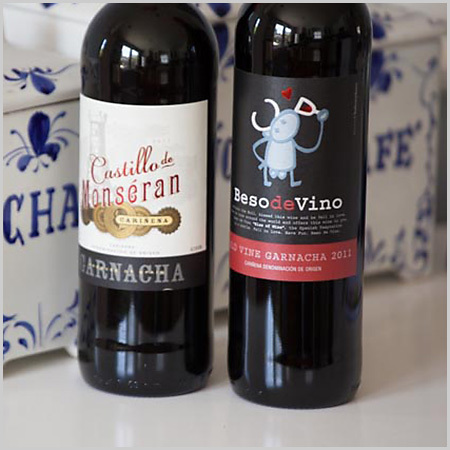 We will definitely be shopping for Spanish wines to add to our cellar and regular consumption. 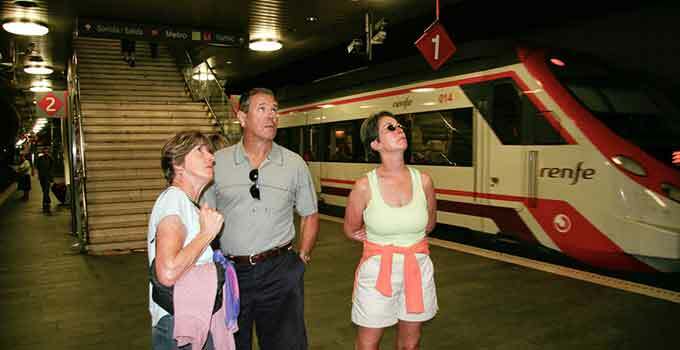 Figure which train to catch to Sant Sadurni d’Anoia. It is a 45 minute train ride. It is fun and adventurous.